Stefan Johansen insists Celtic can prove their quality by getting back to winning ways against Ross County. The Premiership leaders lost 2-1 at Dundee United on Sunday, ending their eight-game winning run in the league. "Good teams bounce back right away so we will just focus on that game because we want to get back on the winning run," Johansen told the Celtic website. "Ross County try to counter-attack but if we do our own things well enough, then we should beat them." Sunday's result saw second-placed Dundee United move four points behind Celtic. Goals from Nadir Cifcti and Stuart Armstrong sent United ahead before Leigh Griffiths reduced the deficit late on. "It was a game we wanted to win but couldn't do it," Johansen added ahead of his side's meeting with County at home on Saturday. "They scored two easy goals but we had enough chances to win the game so it's disappointing. "Their early goal didn't unsettle us. We knew what they were going to do - sit back and counter-attack - and we were confident we would get our goals, but it was just one of those days. "We needed to keep a high tempo and we created some chances but didn't take them." 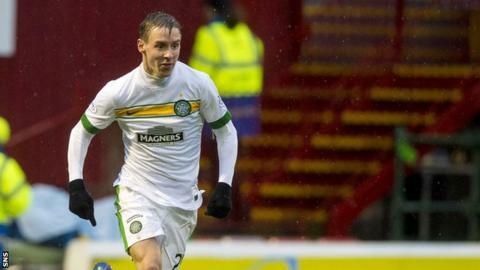 Norwegian Johansen, 23, also paid tribute to the Celtic supporters who made the trip to Dundee on Sunday. "The fans were fantastic at Tannadice and it was a joy to play in front of them, so I'd like to say sorry that we couldn't win," he added. "It's a bit easier at home. It's a big pitch and you have the fans with you. Hopefully we can win."